Ellen Miller of the Sunlight Foundation has made the argument that transparency should be the chief virtue of government and worries that everything from hard-to-strip fiscal data in PDF files to the locations of senate hideaways creates an environment of obfuscation and secrecy. 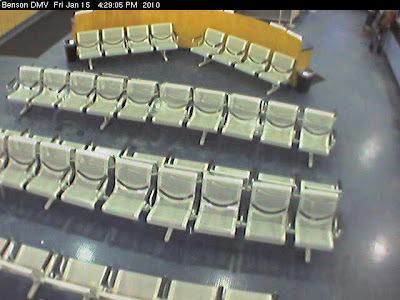 Recently, she noted on her Twitter feed that the DMV offices in the Washington D.C. area offer live webcams in their Georgetown offices to allow citizens to assess how long the lines might be at any given moment. DMVs in Alaska offer the same service to their online potential customers. Of course, the question is whether the person reading People magazine in the waiting room or picking his nose realizes that he is being immortalized for unseen others, as convenient as these portals into bureaucratic spaces to be occupied in the future may be. The Sunlight Foundation has also sponsored a number of applications that I have downloaded to my iPhone, which include Real Time Congress. Unfortunately, many of these programs don't make use of the iPhone's ability to use geospatial data or capture live sound, which many of the most interesting applications do. Even their Recovery.gov application for Layar isn't particularly exciting, since it is difficult to get a sense of how money is being spent, either well or badly. Naturally, to discourage impulsive vigilantee action or attacks on people in power, there are reasons not to always have real-time geo-location. Nonetheless, the people at Sunlight Labs keep up the work on new applications and may come up with a compelling iPhone application yet.